We split the troop into two teams, with Jim leading one team, and I leading the other. We started the trip with a bang, hiking over Bull Hill with all our supplies, singing jodies (cadences, songs to help with marching) the entire way. It was a great way to keep the spirits up and keep everybody moving. Which was required, because April in upstate New York can be cold and wet. It rained on us almost the entire hike. Arriving at our campsite, we found a muddy mess. The field had been trampled by vehicles and Cadets in the previous weeks performing training exercises, so the ground was just a soggy muddy sinkhole. We established camp further uphill than most of our fellow scouts, hoping that the position would allow the water to drain away from us as the day went on. We set-up camp and watched as other troops established pre-made welcome gates at their camp entrances. These things were beautifully painted, in some cases carved from hardwoods, and utterly impressive. We didn't bring a welcome gate. Instead, we immediately disappeared into the woods with hatchets and axes to cut down saplings and branches to make our own version of a welcome gate. The boys came together and made an old-school sign out of broken branches and small trees, lashed together by our resident knot expert, Scott Morey (my brother). 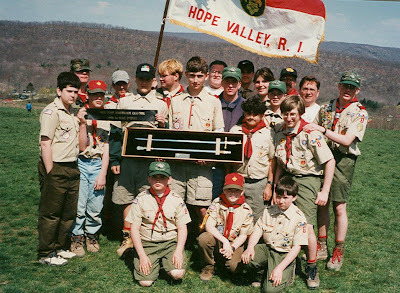 It read: Troop 1 Hope Valley. Nowhere near as impressive as the other gates, but at least we had one. Almost immediately after the gate went up, we were visited by our Cadet Counselor. This young lady would stay with our teams throughout the events the next day and provide guidance. She stayed for a soggy dinner in the campsite and left us to sleep (but not before playing hacky-sack with some of the boys). Unfortunately, a severe thunderstorm came through during the course of the night. The sites below ours became a lake, while ours had water running through it (and the tents) most of the night. Nobody, and I mean NOBODY, slept that night. The next day we arose with the sun, soaked and freezing. Instead of getting miserable, the troop's scoutmasters had hot chocolate and drying lines ready for us. We were able to warm-up (briefly) before forming into our two teams for the events of the day. Then the real fun began. Our Cadet Counselor arrived with our schedule and start point for each team. Each activity was scheduled to take 25 minutes (signaled by a horn), with 5 minutes to get from station to station. Now the difficulty in this is that we needed to carry most of our supplies with us for the events, and some of the activities were 1/2 a mile away from each other. We would need to move fast! Jim and I formed our teams and split the load, taking the brunt of it on ourselves. We then separated, where we wouldn't see each other for the rest of the day. Jim took 6 kids (including my brother), and I took 5. As my team sprinted to the first activity station, I decided that this would need to be a fun day, as these boys were still on the road to Star Scout and were still learning the basics. We get to the first station, and it's first aid. The cadets simulated a car accident with people thrown from the vehicles. Our job was to assess and treat before handing off to the medics who would arrive in 25 minutes. Thankfully, the mother of one of our scouts was a ER doctor or paramedic (I don't recall which). He actually quickly took charge of the situation, sorting out the wounded and giving instructions to the scouts. I already had the First Aid badge, so I was his primary assistant, as the others worked with the knowledge base they had. According to the Cadets, we had everyone stabilized in less than 15 minutes, much better than anyone expected. We were so excited, that we actually did push-ups in the mud until the medics arrived. I'm not sure what it accomplished, but the Cadets even joined in with us. The horn exploded as I was face down in the mud, the scouts pulling me back to our feet as we sprinted to the next station: rope bridge. There was a fake water hazard that a scout had to navigate with a rope. He would secure the rope on the far side and each scout would make a swiss-seat and cross the obstacle upside-down from the original rope. As I knew the knots, I went across the hazard, and affixed the rope, as the scouts built their swiss-seats (a very uncomfortable contraption that squeezes you between the legs and around the waist. The lightest boys were clipped into the rope bridge and sent first, with the bigger boys pushing them to get a head start. When the boys crossed the obstacle, I would grab their hands and yank them the rest of the way to the tree. After everyone was across, the last boy would untie the knot on the far side and run the hazard course like I had. Again, we had a great time. We yelled encouragement, we screamed, we laughed when somebody would slip, and we finished in less than 10 minutes... remarkable. The next 15 minutes were all jumping jacks, again with the cadets keeping count and performing with us. This continued through 12 more stations, our two teams running and shrieking like maniacs from station to station, laughing and joking at each station, but finishing quickly, and then doing something else physical to get the cadets involved and kill the remaining time. I know both teams were doing it, because at one checkpoint I rounded a corner to see Jim Lord's face come out of the lake as he was in the push-up position with his toes on the beach. His entire team was on the beach, but he took it one step further. As the day progressed, we started to realize something. Our teams were scoring incredibly well. I don't think we were in first place for any of the stations, but were consistently in the top five at all the stations. We might actually place! When I brought this up to my team, it brought on another burst of energy, as we weren't just trying to have a good time, but instead could go home with a ribbon. Talk about a jump to moral! By the end of the day, we all struggled to climb back up the hill to our campsite. Our arms were tired from push-ups, and our legs were exhausted from the constant sprinting, but we were happy. We had a great time, and maybe cracked the top 5 troops out of the 100+ attending for the event. I quickly crawled into my tent and collapsed. Unfortunately, some of the other boys in the troop didn't have the same idea. Apparently one of them brought a water balloon launcher. Since we had the highest campsite (we held the high ground) the boys retreated into the woods on Bunker Hill and then proceeded to bombard the other campsites with water balloons. Cadets went into the woods, searching for the delinquents, but our boys were able to circle around and return to camp without being caught. The next morning we got dressed and broke camp. Most of the other troops marched to the formation location, we meandered. Some boys forgot their full uniforms, so we put them in coats and hid them in the back. You should have seen the looks we were getting from the other Scoutmasters. Apparently, we were doing everything wrong. "In fifth place, Troop one (we held our breath)... eleven from whoknowswhere"
We let out the breath and sighed. "In fourth place, Troop two-hundred thirty-seven from idon'tknowwhere." Jim and I share a nervous glance. "In third place, Troop One (the entire troop gasps)... Charleston Virginia"
We all exhaled, and shoulders start to slump. "In second place, Troop 3... Kingston, New York"
The announcer begins to rattle off a lot of accolades for the winning troop. 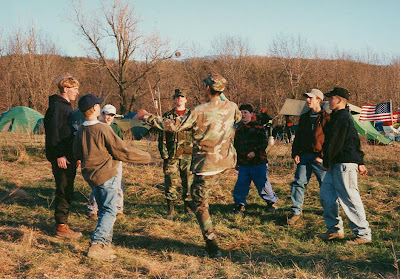 An explanation of their honest, skill driven gateway, a description of their feats of skill at the individual activities, and how the troop ran some of the Cadets into the ground with their different physical activities. To be honest, I was barely paying attention, because at this point, Jim, Scott and I hatched a plan. No matter which troop was called, we would jump up and down like maniacs, yell and scream... and then act disappointed and embarressed. It was a last show of defiance, because everybody was going to know who Troop One Hope Valley was, even if it meant being difficult. "The first place Troop, and Winner of the 1996 West Point Invitational Camporee: Troop One... (We start screaming and jumping) Hope Valley!" Dead silence. We all stopped in the space of a single breath. We were so loud we didn't know if we had heard it right. They had to make the announcement again before we realized it was really us... and then we staggered to the parade review area, too stunned to form into proper formation and march (as was expected of us). 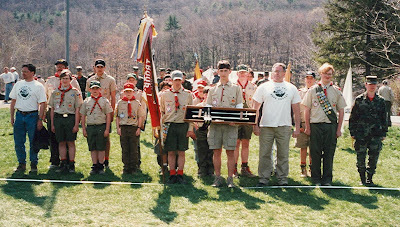 Jim Lord (who still had his mouth open even after the walk) was presented the sabre and ribbon, and we all just stood around stunned as the band started to play and other troops passed by, saluting the winners of the Camporee. Remember how I said the other Scoutmasters looked at us when we originally arrived on the field? This did not improve their disposition. After the parade, I found our Cadet Counselor, and learned a couple of things. Yes we were good, but what most of the other troops didn't know is that there was a morale quotient to each score. Although our skills were not the best at any of the stations, we were good enough to be top 5 at nearly every station. On top of that, we were the most motivated, loudest, and having the most fun. That gave us the highest morale quotient, which put us at first or second for every event. We won because we had a good time! When we got back to Rhode Island, an article appeared in the local paper, titled: The F-Troop Rides Again. 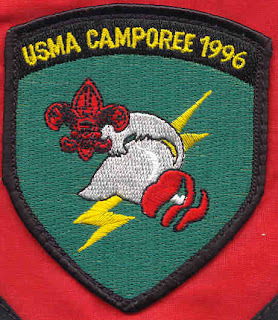 Our Scoutmasters had no idea what happened, and were stunned, as the troop was regularly acknowledged as goof-offs. With the power-houses that were there, we shouldn't have one at all; but we were all proud of our accomplishment, and it added a pride to the Troop that was missing before. Now, this is a long story, but there is a leadership point. As a leader, you need to find opportunities for your team to have fun, even when doing their job. Plan some activities that can allow them to express themselves. A bar night, a barbecue, a gold tournament, a football game. If all you ever do with your team is work, then they will eventually get tired of the stress and lack of fun, and move on; or become drones without personality. Besides, you never know... when you're having fun, you may accomplish something you never through possible.